There are lots of addition and subtraction is going with the upcoming Microsoft Windows 8 & Windows on ARM.Microsoft's browser rivals to publicly commit to a Metro edition. Microsoft has said it will ship both Metro and traditional desktop versions of Internet Explorer 10. Metro is Microsoft's label for the touch-enabled interface at the center of both Windows 8 and WOA. Windows 8 will run Metro and traditional 32- and 64-bit Windows applications, but WOA will run only those third-party apps designed for Metro. Not only IE but also Firefox will follow the same trend. 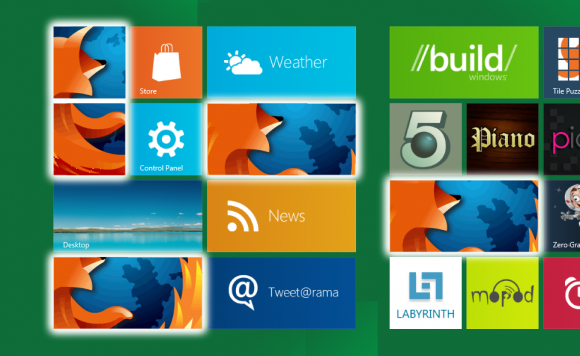 Mozilla confirms that it will build a "proof-of-concept" version of Firefox for Windows 8's Metro touch-first interface next quarter, then follow that with more functional editions later in the year. Mozilla Said:- "This proposal depends on Microsoft providing the same capabilities for Firefox as it does for IE -- running at the Medium level integrity process that allows us the full use of the Win32 API and what we need from Metro, or a set of APIs that allow Mozilla to port Gecko to the WinRT. For the purposes of this feature proposal, I'm assuming we'll get the first and we won't have to port the bulk of Gecko and instead will use the win32 dlls from within Metro." Windows 8 contains two application environments, "Classic" and "Metro". Classic is very similar to the Windows 7 environment at this time, it requires a simple evolution of the current Firefox Windows product. Metro is an entirely new environment and requires a new Firefox front end and system integration points. Firefox on Metro is a full-screen App with an Appbar that contains common navigation controls (back, reload, etc.,) the Awesomebar, and some form of tabs. Firefox will have to support three "snap" states -- full screen, ~1/6th screen and ~5/6th screen depending on how the user "docks" two full screen apps. Our UI will need to adjust to show the most relevant content for each size. In order to provide users with access to other content, other apps, and to Firefox from other content and apps, we'll need integration with the share contract, the search contract, the settings contract, the app to app picking contract, the print contract, the play to contract, and possibly a couple more. We'll be a source for some, a target for some, and both for some. We'll need to handle being suspended by the OS when out of view. Ideally we'd be able to create secondary tiles for Web-based apps hosted in Firefox's runtime.